Apple's new smart case will keep your iPhone running for up to 25 hours. But at what cost? Apple today unveiled a surprise new $99 iPhone “Smart Battery Case,” available in white and charcoal gray — designed to not only protect your iPhone 6s or iPhone 6, but also to give it considerably longer battery life. While Apple does not give specific battery capacity details, it notes that the battery case offers increased talk time up to 25 hours, Internet use up to 18 hours on LTE, and video playback up to 20 hours. The case features soft microfibre lining on the inside, along with a soft elastomer hinge design to make it easy to slip the case on and off. The outside material is make of silicone. When the Smart Battery Case is on, the intelligent battery status is displayed on the iPhone Lock screen and in Notification Centre, so that users know exactly how much charge is left on the device. The case supports Lightning accessories and also works with the iPhone Lightning Dock. Personally, I’m not at all keen on the way that the external battery adds an extra “hump” to the iPhone, and would prefer something a bit more rugged and heavy duty that would keep the back of the device flush. Would wireless charging really have been too much to ask for? And where’s the iPhone 6s Plus version? 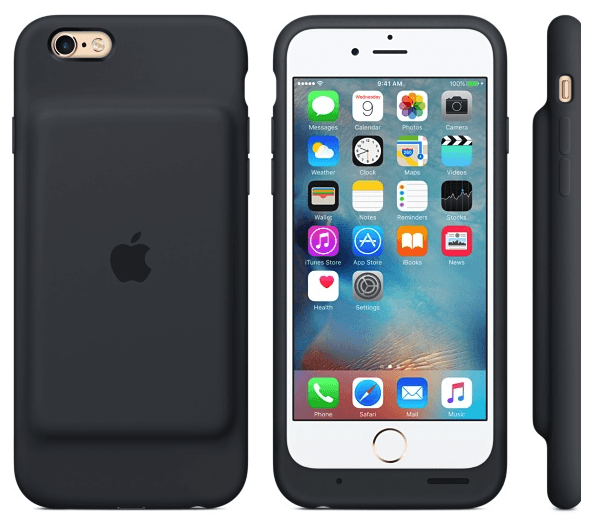 What do you think of Apple’s new Smart Battery Case? Will it be on your Christmas list this year? Leave your comments below.